The bears are sounding the Trumpets of Doom on Wall Street. And for all those investors curled up in the fetal position under their desks, I want to offer a way out. A solution I can prove to you here today. Sure, gold went down on Wednesday after rallying on Monday. It zigs and zags. But the trend is up. It has been since August. There are a number of forces driving gold higher. Interestingly, it has pushed higher even though the U.S. dollar has been strong. Or, I should say, strong for now. The dollar is strong because foreigners are pouring money into the U.S., because their own economies and currencies look terrible by comparison. But the dollar has fundamental problems that will come home to roost. The dollar is also stronger because the Fed keeps tightening. It’s expected to keep tightening all through 2019. I think the Fed will stop a lot sooner than that. Let’s start with my view that Fed Chair Jerome Powell sees the easy money policies of his predecessors as way too accommodating. He wants to roll those back. So, he’s hiking rates. But there are serious problems with this. One is that many foreign countries and companies have debt denominated in dollars. The Bank of International Settlements says U.S.-denominated debt to non-bank borrowers ballooned to $11.5 trillion in March 2018. That’s the highest recorded total in the 55 years the bank has been tracking it. As rates go higher, interest payments balloon. This strains economic systems and corporate balance sheets. And nervous investors, seeing the writing on the wall, head for the exits. Not only in stocks, but in currencies. Look around the world. The Turkish lira, Argentine peso, Indian rupee, Russian Ruble, Brazilian real and more have all fallen by double-digit percentages this year. We know where all that money is going — into the dollar and U.S. investments. So, that pumps up the dollar even more. But when the dollar gets too strong, it’s a drag on America’s economy. First, because half of S&P 500 revenues come from outside the country. So that hurts corporate profits. Second, a strong dollar hurts U.S. exports and therefore U.S. factory production and employment. And this is why President Trump is so angry at his own Fed chairman. This week, the President said that Mr. Powell “almost looks like he’s happy raising interest rates.” Mr. Trump added it was “too early to say, but maybe” he regrets nominating Mr. Powell. My view is that this Fed chairman, like others before him, is overplaying his hand with interest rate hikes. Heck, we just saw new-home sales plunge to a near two-year low. As for stocks, some big names are keeping the major indices propped up. Behind the scenes, more than 350 S&P 500 stocks recently were down 10% from 52-week highs. And 179 were down at least 20%. Stocks anticipate the future. Stocks are telling us that if the Fed doesn’t change course, it could steer us into recession. And that’s why the odds of a rate hike in December — while still high at 75% — are falling. The odds of a hike used to be 90%. So let’s say the market, the president, the economy and a massive mountain of foreign debt force the Fed to moderate its stance. What do you think gold will do? I think gold will blast off. And I think the smart money knows this. That’s one reason why gold bottomed and is heading higher. 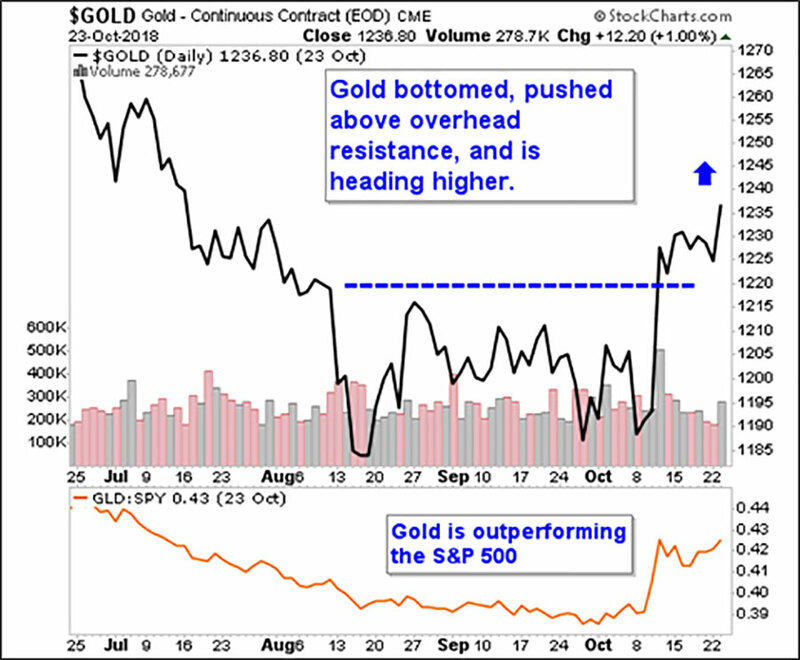 There are other fundamental forces revving up gold, which I’ll try to get to in a future column. This chart from Deutsche Bank shows that the U.S. Treasury missed its opportunity to extend debt maturities while rates were near multidecade lows. 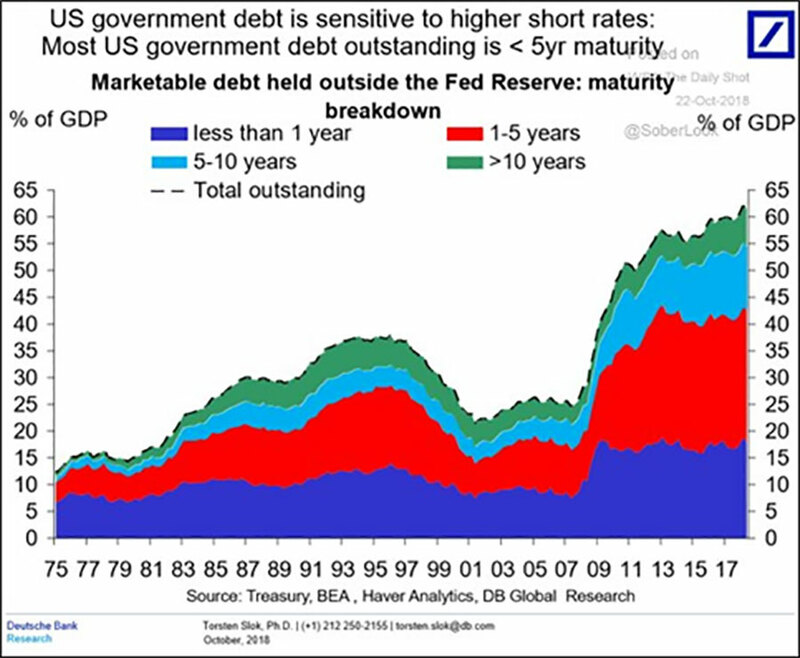 There is a Hindenburg level of debt coming due. And the chance to refinance it on the cheap has passed. 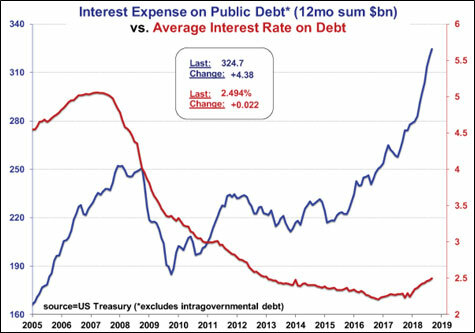 Our national debt is only going up. 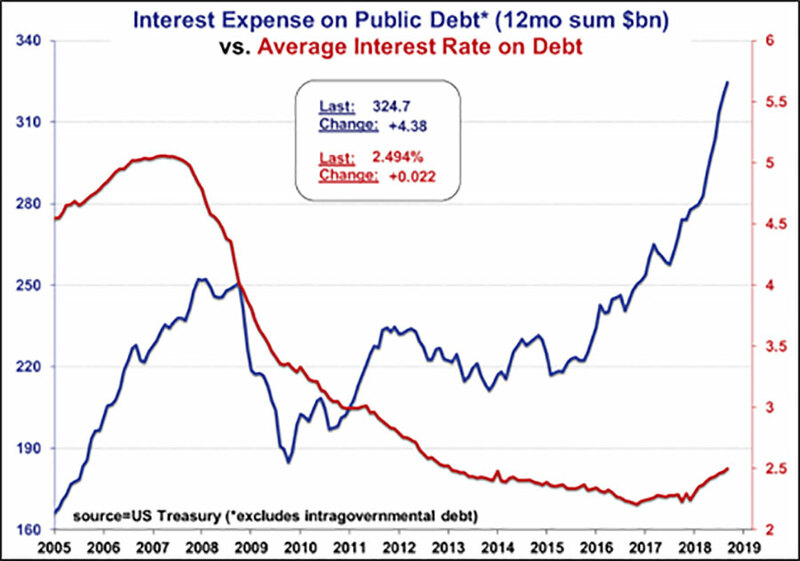 U.S. gross national debt rose by $1.3 trillion during the 2018 fiscal year to $21.5 trillion. That’s 105.4% of GDP, if you’re keeping track. And this increase was 33% bigger than the hikes between 2011 and 2017. It’s going to get much worse. The current Treasury estimate puts the 2019 deficit at $1.085 trillion! With $1 trillion-plus deficits to come as far as the eye can see. So, in the end, why will the Fed stop raising rates? Because it can’t afford to do otherwise. The dollar, like gold, is a safe haven. For now, funds are flowing into the dollar. But there is one dynamic difference between the dollar and gold: The government can’t print gold. To sum up, I expect U.S. rates to stop rising sooner rather than later. I expect the value of the U.S. dollar to peak at the same time, and start to fall under a flood of money-printing. And I expect gold to go much, much higher. Well-financed companies leveraged to the gold price are even better. That’s what I and my subscribers are buying. What are YOU buying? Does the gov. know who has gold? I would appreciate a listing of your 5 favorite royalty/mining gold stocks if you care to provide. Thanks, Sean. But are you only speaking of your AU gold recommendations or are you suggestng to purchase all of your former gold buy stocks?